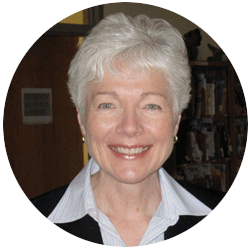 Marilyn Friend, Ph.D., has spent her career as a general education teacher, special education teacher, teacher educator, and staff developer. She has served on the Board of the Teacher Education Division of the Council for Exceptional Children. She has consulted with school professionals nationally and internationally (more than 1000 presentations and projects in the United States, Canada, Europe, and Asia) as they collaborate to educate their students, assisting them to form productive and efficient work teams, to learn the best ways to manage awkward or adversarial conversations, and to communicate effectively with parents. She's the author of the Co-Teach Handbook. 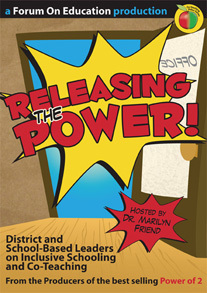 Releasing the Power is the next training video in the Forum’s Co-Teaching Video Series. Leaders at the Charlotte-Mecklenberg School District decided that to meet achievement and accountability standards mandated in federal education law, they had to do something very different. If students with IEPs continued to be educated largely in special classes and resource rooms, those students would have a difficult path to success. Releasing the Power illustrates how the Charlotte-Mecklenberg School District researched, created, and implemented a district-wide co-teaching initiative. Today CMS is an exemplary model of what can happen when a district releases the power of two. First on this DVD, CMS Superintendent and his top deputy for Special Education discuss the district’s inclusive Facilitator's Guide PDF /practices and co-teaching journey from conception through implementation. Then you’ll hear CMS principals discuss, in practical detail, the expectations, challenges, and supports necessary to ensure all students are learning in co-taught classrooms. DVD includes a digital viewing guide and a rubric for judging the fidelity of your implementation using a framework developed by Professor Friend. District leaders and school leaders implementing inclusive practices and/or co-teaching, or those who question the results they are getting from their current model. The program will help them avoid needless pitfalls and create a productive dialogue to further their own implementation.